Monopoly Here & Now slot is a tribute to the immensely popular board game of the same name and incorporates all its exciting features except for the fact that here you don’t play for monopoly money. At stake is a jackpot of 5000 real coins. 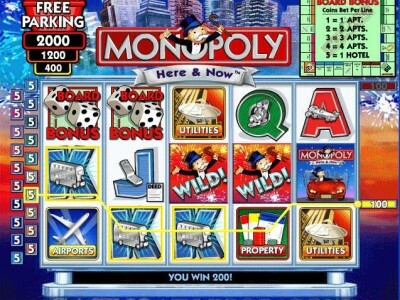 Being packed with bonuses and multipliers, it offers plenty of opportunities to win big. 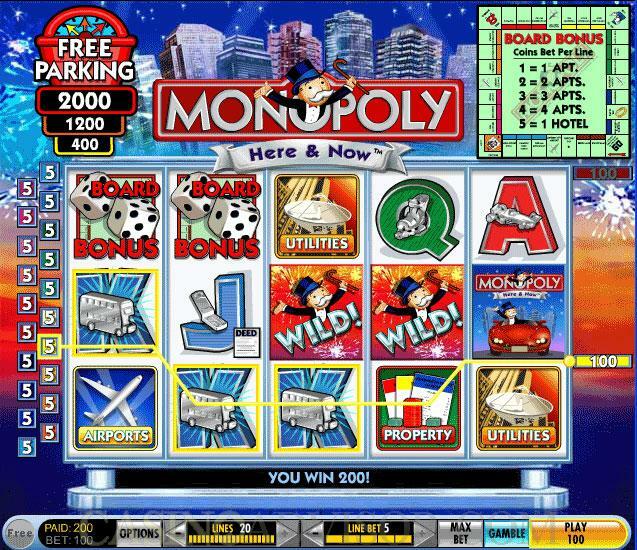 Monopoly Here & Now is a 5 reel 20 payline slot with a bonus game and other features. Mr. Stanley, is the wild symbol in this game. It substitutes for all other symbols except the bonus triggering symbol and the free parking symbols. On the other hand, the Property Deeds symbol is the scatter symbol. Line up 3 of these on an active payline and Mr. Stanley pulls a Property Deeds symbol at random out of his hat and throws it on the board. Whichever property the deed falls on is upgraded and adds to its value when you play the bonus round. The symbols don’t end here; there is the Free Parking multiplier symbol, the Bonus Dice symbol and many more. When 3 Bonus Dice symbols line up on the active payline, it triggers the bonus game. To find out how many times you will get to roll the dice in this round, you select three pairs of dice. When Mr. Stanley rolls the dice and it lands on a property, you win the value of that property along with any upgrades you might have accumulated. Just like the board game, a wrong move might land you in jail. However, you can escape from jail also if you still have rolls left. So, aren’t all these features exciting enough to give it try?